Naturally, food is the focus during a visit to Piedmont. Nowhere else does old-world cuisine seem so exotic, and at the same time so fresh and localized. But in exploring the delicacies of a special region, pairing the local wines with what you eat can double the pleasure, and complete the gastronomical picture. What better place for this scenario to unfold than in the land of the coveted Nebbiolo grape?! You bet your sweet bippy we drank our share of it, often in mature vintages. We were delighted by the affordability of these world-class wines when ordered from restaurant lists in their home region, so in some cases, we went a little crazy. 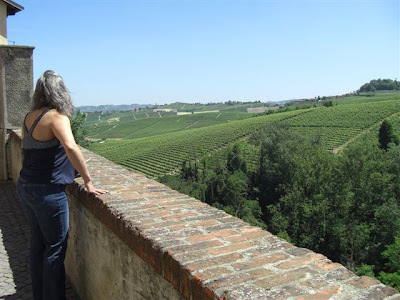 Check out some of my notes on the Nebbiolo we drank there in May, and a picture of Deborah standing next to some of the great crus of Barolo. These new-world examples were apparently the house label of a small trattoria in Monforte d’Alba where we ordered our first meal in Italy. They were colossal wines that even after 8 years seemed drowned in their own oak. Not memorable. My first experience with the producer. This had all the components that make Barolo so special….tar, licorice and rose petal notes presented with finesse over power. Fading tannins allowed the fruit to shine. Deb declared it the best example of Barolo she’s ever had, especially in the setting at Trattoria Della Posta in Monforte. Tasted at the winery in Alba. This is the wine I had mentioned in an earlier blog entry. Beautiful young-drinking Barbaresco with herb and olive aromatic notes. The tannins were in tune with the elegant texture. This is the type of Nebbiolo that draws in the Burgundy chaser. Maturing nicely. This is distinguished and Rhone-like. Showing pepper and mineral with a resiny theme throughout. If this is the potential of aging Cannubis, then sign me up for a few bottles from each of the great producers. Paired exceptionally with rabbit braised in Nebbiolo at Giardino in Monforte. I’ve always thought that this was the best producer in Gattinara, and I was excited to find the ’01 on the list at Albergo dell’Agenzia in Pollenza. This single-vineyard bottling drank at peak maturity. It started in classic Nebbiolo posture, with lots of tar and earth. Decanting further revealed an animal side that suggested Rhone. And finally it began to oxidize and resemble old-style Tempranillo. What a wild ride! I’ll call this one the chameleon.